As you can see, I decided it was time for a small redesign. Nothing extreme, as the layout is the same. Just some new colors (based on the '59 White Sox uniform palette) and a new header. I didn't go nuts and dropped the animated TV gif. I was thinking of a scrolling marquee board, ala the 70's version of the Titanton, but I went simple. 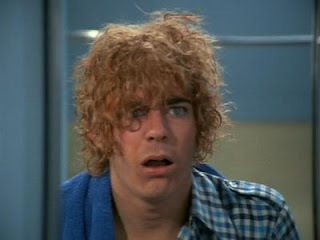 Nothing too drastic. I don't need your help, Oliver! 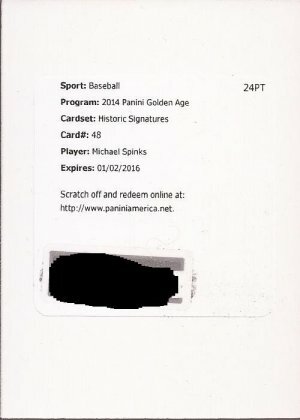 Recently, a local big box (Meijer's) had 5 blasters of 2014 Panini Golden Age. I love the 3 year run of that set, as I have talked in the past. A couple weeks prior I found one at Target, so I did my best to grab as many of the ones from Meijer over the course of a week. I got 4. I want to hunt down the person that got the last one. I am long done with the base. I was just looking for the inserts and hits in the blasters. Remember when blasters contained a guaranteed hit? Well, best I could tell the '14 Golden Age contains hits from the Legends of Music relic set, as all my hits were from that 8 card set. Yeah, I got some dupes, but read on and maybe there might be a giveaway at the end of the post (there is). But the guaranteed relic wasn't all I found in a couple. This is one of the First Fifty serialed cards. You can see the words in the upper corners replacing the scroll work of the base cards. And yes - the numbering is to 50. 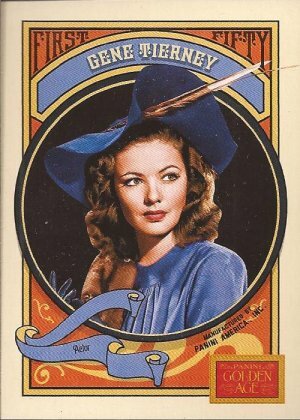 This card is 30 of 50 showcasing the beautiful Gene Tierney. Not bad for a low numbered serial from a blaster. On to the hits. 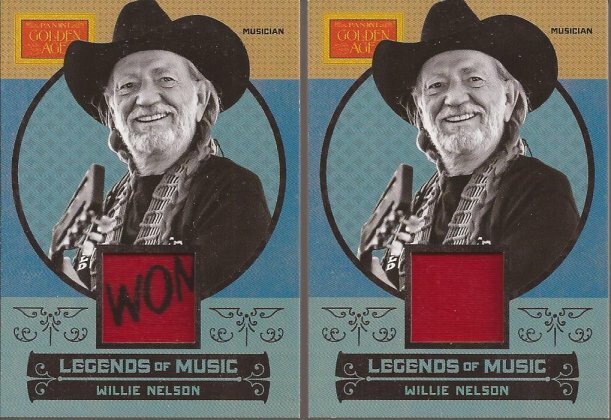 Willie appears in the relic set twice. Two different images, and I assume the relics are different on both. Because they are different on the two cards I pulled. The top black relic feels like, almost like a part of a number patch, so I'm not quite sure what it's from. If it's a shirt, it would be dang heavy and hot to wear. But this other relic is a bandana, plain and simple. And no - both cards do not smell like hemp. Much. 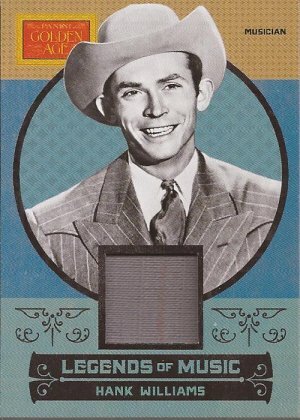 Father to the far less talented former singer of the Monday Night Football theme song, Here's a nice two color piece of what appears to be a jacket from Hank Williams. There are only two kinds of music I hate - Country and Western. But I give a tone of respect to Mr. Williams. Won't buy any of his stuff, but if I know he's singing, I won't turn the station. Nice faint pin stripe in the center. No Nick - this one is mine. Find your own. I was most excited when this card came out of the first of the 4 I got from Meijers. What's to say about a punk legend that I hasn't already been said. The relic is a piece of a t-shirt (what else?) and humbling to own. More so than the Nelson and the Williams. I have 4 of the 8 from the set. 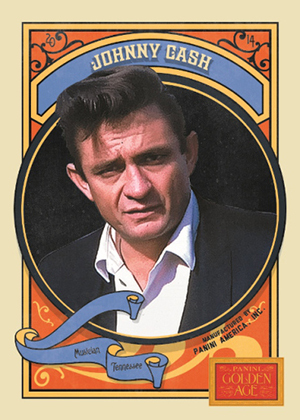 There is a 3rd Willie card, another of Hank and two from Liberace. I don't expect any more blasters, so I will have to complete this set from ebay. However, that wasn't the end of the hits. When I found the relic pack from one blaster (that contained Joey Ramone), I set it aside to save it for last. The pack just before I revealed my relic, this came out. Expired redemption? Yes. But just barely, and Panini has a great history of honoring old, expired redemptions. I quickll made the request, and so far, this is still showing as"active". I redeemed it in the middle of May, only 5 and a half months after the expiration. I'm sure this is laying around the office. I'll post it if/when it showing up in my mailbox. So yeah, with this new blog look, how about a contest? Along with the blasters, I ripped a box of 14 Golden Age from a sale I saw at Dave and Adam's. So I have a LOT of base. So much that I have one complete base set (150 cards) along with a partial set maybe 30 cards short. Plus a few extra inserts and 2 extra Willie Nelson relics. The bandana one. So like I usually run my giveaways, comment below if you want in. I'll go a week or so. Promote if you like, but not needed. Follow me if you want, but again, not needed. Let's close comment entries on 6/12 at 11:59pm. All the names hit the randomizer. The person is position #1 gets the full set with a funky piece of bandana with a word on it. The person at the very bottom gets the partial set with a plain red relic swatch. It's that simple. And if you have any Golden Age inserts laying around from the 2012-2014 release years, my Wants list at the top shows the full size inserts I need. And any minis are appreciated too. Now comes the hard part - Ramones or Hank? Ramones or Hank? If only the Ramones covered a Hank Williams song. I love me some Golden Age! Please put my name in the hat. Love Willie. One of my Favs. Hank Sr definite legend. Nice gets! 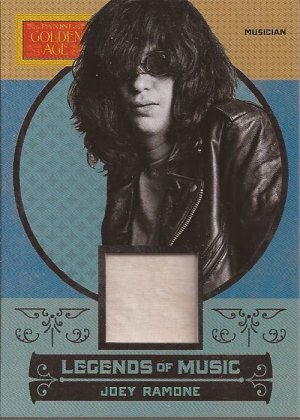 Couldn't really ask for more name recognition and the Joey Ramone is superb! Does jealousy get any stronger than this? i'm in. i've got a couple of minis i'll send your way sometime. I completely missed the boat on these blasters. Really nice stuff! I'm interested to see the Spinks when it arrives. Panini is the greatest with honoring any redemption. Those are some really cool hits, probably better than some of the hobby boxes people busted. I would like to be included in your contest. I grew up listening to country music. Don't listen to it regularly anymore but Willie Nelson is always cool. I'm in for the contest. Great Brady Bunch reference. Oliver! 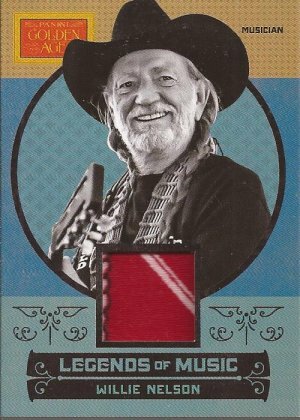 I'm in it for the Willie Nelson relic...I'm probably the only card blogger who prefers country music actually. Free Willie? Count me in! Willie was my Grandmother's favorite. Count me in! Thanks for the contest! By the way, I like the redesign of the blog. Sharp. Willie is cool. Ramones and Hank do nothing for me. Love the new site look. 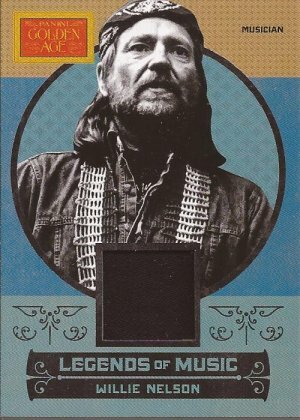 Love the WIllie Nelson cards the Relics are pretty awesome. Gotta love Willie. Thanks for the contest! I like it a lot. I haven't been cruising the blogs much lately and this surprised me. I thought I had hit the wrong bookmark for a second. I'm a country music fan but all the guys I listen to, George Jones, Merle Haggard, Waylon Jennings and Johnny Cash are dead. That makes waiting for new material problematic. I have my own willie, I mean Willie (I really do, I'm not just being funny), but I'd love to win a base set. Thanks for the chance. Nice new look. Will take a little while to get used to... Cool a contest. Wait it isn't for a set of the Topps 1971? Brady Bunch? Golden Age is cool. Willie is cool. Even the blog redesign is cool. Cool. I like the new digs... and thanks! Ah, you've redecorated. Me likes. Woo! Thanks for the contest!